After combing through hundreds of previews for EXPO Chicago, I wanted to share an exclusive look at some of my favorite pieces by both emerging and established artists. Enjoy! Federico Herrero’s intensely visual language is rooted in his observations of everyday life in Costa Rica’s ever evolving landscape, especially the way nature and culture collide. Color for Herrero is an expression of space, both the absence of space and the abundance of space and the relationship between them. For more than twenty-five years, Sime has made collage and sculptural assemblage from found objects such as thread, buttons, plastic, animal skins, horn, fabric and bottle tops, alongside organic building materials and binding agents such as mud and straw. Many of the objects come from Mercato, the Addis Ababa open-air market said to be the largest in Africa, and in particular the market’s Menalesh Tera section—literally “what do you have?”—where trash is repurposed in resourceful ways and its new potential is shared among the community. Yturralde’s new paintings express creative vitality both through their monumentality and their chromatic sensuality. The beauty of light and its variations are central to his reflections about overflowing the limits of painting towards immateriality, and the path of the sublime, the void and the infinite leads us to a creative spirituality which can be associated with the symmetrical resonances of mandalas and the expressive conciseness of haikus. In Sara Rahbar’s work the 21st century human condition is visualized by assemblages of collected tools of trade satisfying basic human needs and referring to memory and ideological symbols. Her Flag-series is a sculptural rumination on the concept of national belonging: a collection of American and Iranian flags, overrun with belts, beads, ribbons, and embroidery. Sam Durant is a multimedia artist whose works engage a variety of social, political, and cultural issues. 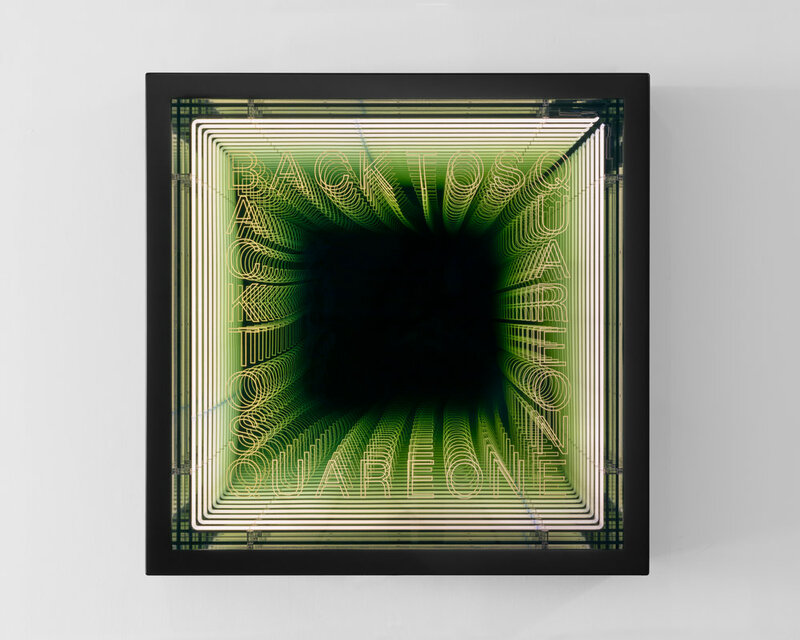 Often referencing American history, his work explores the varying relationships between culture and politics, using bold text to invoke our own self reflection. There is a broad theme of spoken and written word throughout Ann Hamilton’s work and is especially apparent in her references to books. She often speaks about how people are "storehouses of knowledge transmitted through text" and wondering "what happens when a reader meets a new book?" She is struck by reading being so influential, but leaving no physical trace on a person. According to the artist, "what happens when you slice through a book is almost analogous to what happens when you read things." A particular slice of a book can impact us differently based on our own life experiences. Wolowiec sources images from social media sites and weaves them into complex tapestries using a hand loom, blending contemporary digital trends with the technology of weaving. She finds images by searching hashtags and geotags and finds patterns within the group to help her designate which photos to use. She then transfers the images onto groups of threads through a sublimation dye process. What results is a tactile and seemingly weightless tapestry that speaks to the white noise and static of the contemporary digital mind. Manley's recent work captures emotional and psychological expressions on the canvas, allowing himself to open up his gestures and movements. With this new approach, he establishes a singular technique—sculpting the oil paint with a palette knife—that results in colorful, highly-textured, abstract canvases, that in instances encapsulates sharp cuts of paint and in others soft undulating effects. 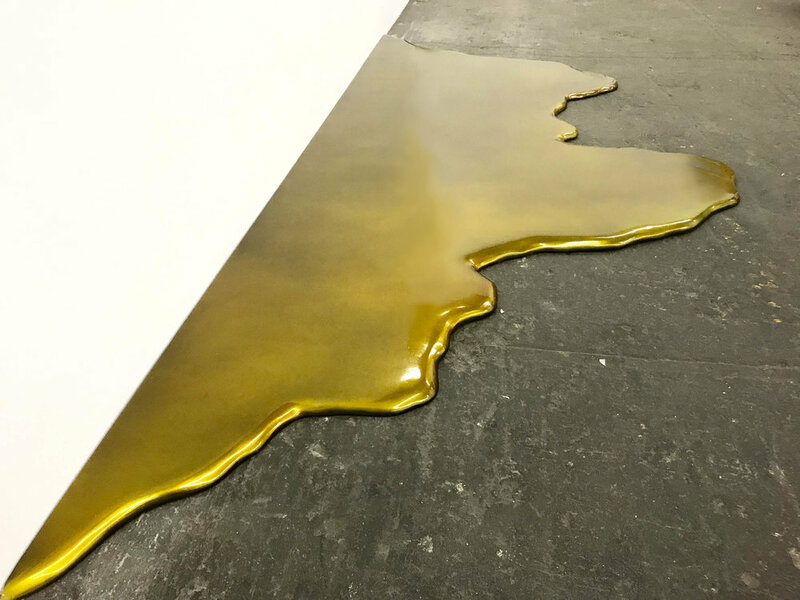 Lofgren’s conceptually motivated practice focuses on cultural anxieties and ritualistic behavior in contemporary and ancient times with reverence for process and material. From a decolonial and feminist perspective, the artist dissects the history of power and controlled knowledge through the lens of cultural and other wild systems. Nick Dawes' painting process involves a gradual distillation of everything that makes a scene memorable: mood and atmosphere, feeling and emotions, bodily sensation and state of mind. His paintings provoke a personal response by the viewer; the focus being on their individual emotion rather than on the subject matter. The work of Italian artist Claudio Parmiggiani is concerned with themes of absence, the inevitable passage of time, fragmentation and silence. Over the course of his career, Parmiggiani has maintained a radical stance and singular vision, interrogating the power of memory and shared history, as well as the dual nature of time, with recurring motifs such as dust, fire, glass, shadows and empty space. Leigh’s practice is an object-based exploration of vernacular visual traditions from African history and black female subjectivity, black feminist discourse and histories of radical resistance. Inspired by objects like African-American face jugs, her new ceramic sculptures conflate a woman's head with pitchers or vases as if donning a crown. Known for his surreal paintings of soft figures caught in moments of contemplation, the Düsseldorf-based Lenz Geerk presents mysterious collage paintings of people in action often pictured from above, with their faces covered. Through the color, line and focus of these works, Geerk creates psychologically charged paintings that are removed from a specific time or place, yet of this hour. These paintings capture and reveal the usually concealed human psyche through atmosphere and body language. One of a new series of beaded skinning boards, POWER! draws upon Gibson’s aesthetic sense and confident eye. 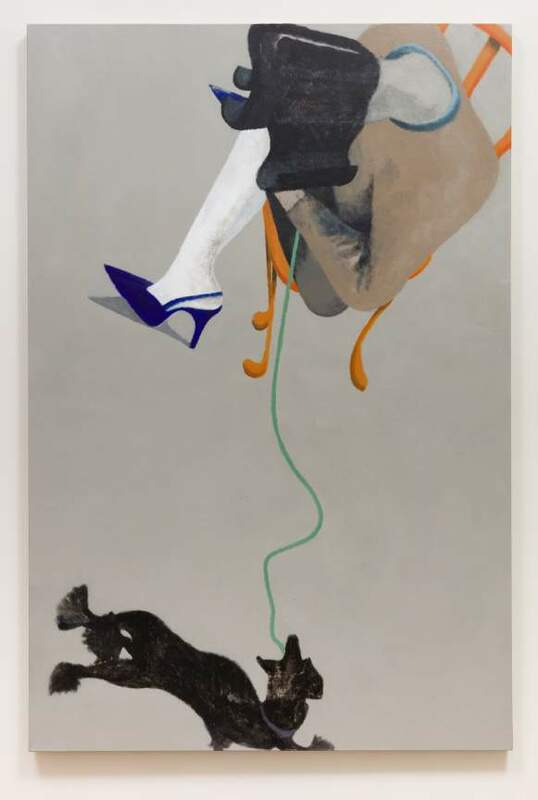 The work’s board base references the artist’s grandmother, the wife of a Southern Baptist Minister and devout Christian, and the regimentation of modern domesticity. Layered with alternating text and decorative beadwork, the board becomes as heavy and imposing as historical war shields. POWER! resists this format, moving away from beadwork which previously used geometric abstraction to explore innovative designs referencing op-art and psychedelia. The wording of ‘POWER’ fills the surface space, conveying how - whether as a quality, a tool, or a weapon – power is inescapable. 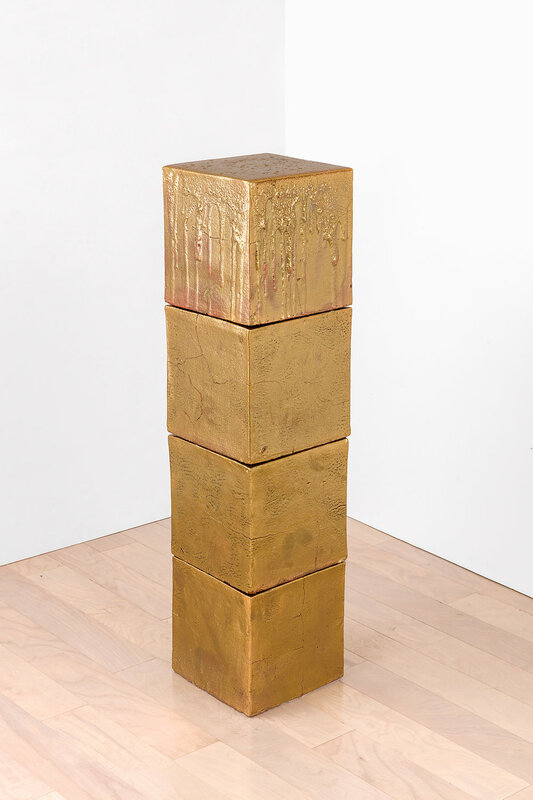 These small-scale sculptures transform the American concept of the idealized commemorative object, fetishized and mass produced into a slightly disfigured, oddly dystopic symbol of consumerist greed and materialism. Martinez implies that Liberty is simply another falsified construct, an overwrought and sentimental nod to a future ideology that will likely never manifest culturally, wherein all the moral principles that go hand in hand with social transformation are not realized. As an object, Martinez' Liberty is objectified and parceled out in much the same manner souvenirs are taken as smaller consumerist stand-ins for larger cultural concepts, again diluting their fundamental meaning. Since 1989, Roxy Paine has been filling galleries, museums, and sites worldwide with his dark, whimsical installations and sculptures, melding the industrial and the organic to explore manmade and natural systems—and their ramifications. As he describes: “I’m skeptical about the potential for horrible consequences, consistently realized. But at the same time we are able to feed six billion people through science and altering nature. That’s kind of a miracle.” His “Dendroids" series are stainless-steel forms resembling trees and the nervous system. Drawing on social issues and political events, notably the aftermath of Pinochet's reign and the scars of other dictatorships in Latin America, Navarro creates light works that reflect on the trauma of recent history. Navarro repurposes familiar materials to comment on past events. Navarro combines the drums and lighting to create a visual representation idea of sound (or noise) while at the same time removing and negating the original function of the instrument. Sodi employs the systematic approach of minimalism but eschews the cold precision of industrial manufacturing, electing to use traditional methods that retain the essential character of the local elements rom which the sculptures are created. Sodi begins his sculptures by extracting raw earth, mixing it with water and sand to form clay –an ancient medium. The clay is shaped and smoothed by hand into solid cubes that are left to air dry in the sun. Once cured, the cubes are fired in a traditional brick kiln with wood, jacaranda seeds and coconut shells, a process that imbues the cubes with varied terracotta hues, streaks of green and black, and a multitude of fissures in the surface, giving each cube a unique identity.